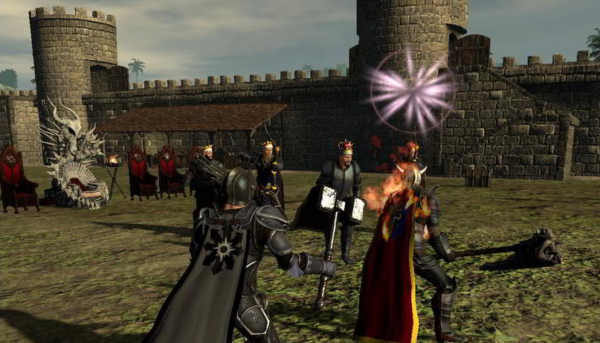 Shroud of the Avatar is an MMORPG with a sandbox twist to it. The narrative itself is more focused on each individual player’s perspective and their decisions will reflect on literally everything later on. Whether or not you saved a child from a burning building might just determine whether or not you get a special weapon or thrown into a prison. Your decisions matter, and it’s one of the biggest things that make the game fun. You’re put into a fantasy world where player housing dominates the landscape (although very expensive player housing). There are no classes, only skills and player’s playstyle that determine how well things turn out for them. Overall, it’s definitely unique with a lot of room to expand on the idea the devs have started. Upon logging into the world for the first time, whether you’re doing offline single player mode or online with everyone, you get to create your character. You can have a few of them too if you decide to take a role playing route on it. The process of designing your character is very basic currently, with little to differentiate you from the other 50 new characters that may appear when you do into the world. You get a couple face options, skin color, slight hair color variants (and I do mean slight as most look almost the same), and then you can change a bit with the sliders but those don’t vary much either. Once you’re finished with your character, you can begin your journey by starting out in a burning village! What excitement! It’s vague on what you have to do and how, but that’s sort of the point since how you do things is up to you. You can save a little girl or leave her, get a bow or swords or a spear, or do it all and take on those zombies and skeletons that block your path as you learn to fight. After the odd tutorial and foot travel that seems to have taken forever, you finally get to finish your customization with your path option and some skill choices. This is done via text when talking to the avatar lady. The way most things work in the game is entirely through text communication with the NPC’s. There will be options highlighted with various colors and they will determine which path you take as well as your starting stats and skill set. You’ll be able to unlock everything in time, so don’t sweat it much if you didn’t get the path you wanted. After you’re done, you get cast off into the world at a starting zone, depending on the choices you made and what you do after that is up to you though I’d recommend just doing any quests you can find for money and experience for skills. In early access, I could only choose the Path of Love, which had wound up making me do a bunch of quests helping out couples with missing relatives and partners all over the place. This is how your decisions will shape the path ahead of you. There is a hunter path, which will deal with trapping animals, retrieving hides and things hunters would do for money and so many other unique paths you can start out in. The quests available to you will change depending on the choices you made as well, making it unique for everyone unless they intentionally make identical decisions (and even then it’s still different!). But after you’ve got a direction, be it exploration, trading, or hunting/questing, you can continue down that path and make money to purchase skills and eventually own property of your own to build on and manage. So, how does the classless combat work? Well, the skills are mostly determined by which weapon you use as well as magic elements. There are 8 magic types to use from life to dark to chaos, it gets confusion quick, and then there are the 6 weapon skill trees that deal with things like bows and swords. You can use all of the magics at the same time as wielding any weapon, so it allows for a pretty flexible playstyle. Want to be that healing flame sword character? Well, it’s possible to ignite your weapon on fire and use healing magic too! The combat itself is action based and quite smooth with directional targeting. I found it most enjoyable as a ranged character since the melee felt clunky when trying to dodge from the enemy. The AI isn’t the most intelligent and you can get them stuck on trees and rocks as well as even shoot them from afar and they won’t even notice at times. However, they aggro based on sight, so if you’re brightly lit up with a torch and running through an open field, you can bet ya they’re gonna come at you. You get 9 skills per hotbar, and two types of hotbars. First, you have your battle hotbar. This one will be displayed during battle (with an option to keep it on always) and you can set up your fighting skills on it so they don’t take up space on your other one. The second one is unlocked through an option in one of the NPC leaders’ dialogue if you ask them about that type of skill. That one is for when you’re out of combat, so things like your sprint, light, or quick swapping items. In addition to all of that, you can have two weapon sets. Keep in mind that your gathering tools are also considered weapons, so you’ll have to constantly be swapping them out to be able to use all of them. Most people use one set for tools and the other for ranged fighting, whether that be with a bow or magic staff. You can also go full gathering and use them both that way as well, with no real limitation on the combination you use so it’s pretty easy to keep track of. Naturally, as a sandbox game, crafting is important right? Absolutely, and this game is no exception. Each skill has it’s own perks and they all also have a chance to fail or “fizzle” which wastes the mana it would have used and puts the skill in cooldown regardless. To be the best in magic, you want to keep in light armor and avoid melee fighting since the debuffs they can stack on you give higher fizzle chance leading to more fail casts. There are two types of skills, crafting and adventuring. Your combat skills, magic, and healing skills, as well as mobility and other buffs are all in the adventuring category. Each of the options in that category also have several subcategories allowing for various builds to be possible. 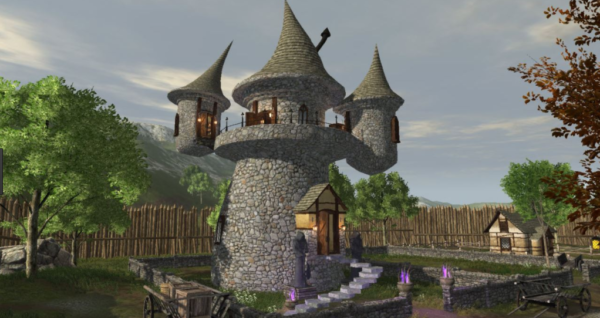 The crafting category is as the name suggests, dealing with things like carpentry, decorations, smelting, and so on. There is also taming, which is found in the crafting category, as well various miscellaneous skills. You can tame almost any creature you fight, and even make some of them become mounts which is a huge plus for me! I found it really nice when I was able to ride a wolf instead of running around everywhere. Overall though, there are over 20 skill categories and hundreds of skills. You’ll be able to make the character you want exactly how you want. That alone leads to some really unique builds between each person. 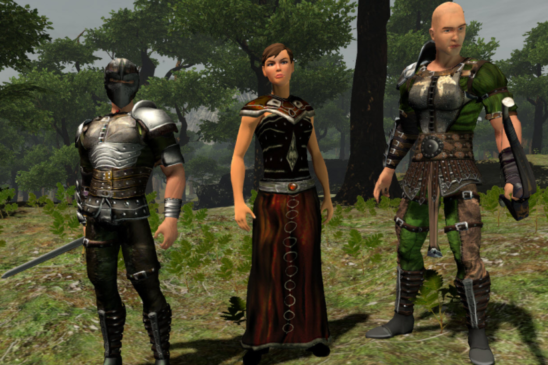 While Shroud of the Avatar is an MMORPG, it also allows you to be selective on who you’re playing the game with. Maybe you don’t care to see hundreds of players just crowding an area chatting out of boredom? Well, you can change your play mode to become local multiplayer, or “with friends”, which will remove all of those from your game session. Their homes, cities, economy, and everything else is still there, but they will no longer be visible or chatting for you. This is especially helpful if they’re blocking NPC’s you need to chat with. Alternatively, there is even an offline mode where you’ll be able to play through over 40 hours of story content completely alone. It may be useful for someone without a lot of time or dedication to sink into the game, but I found this mode dull and lonely since I’m used to playing games with others. Offline is good though if you don’t have internet access at that time, such as camping or something. Options are always good if they allow you to play it anywhere! The game is still pretty basic in terms of design and it gets confusing easily if you don’t understand exactly how the quests work. Having to constantly type in what you’re looking to chat with the NPC about for a chance that they recognize what you said can be tedious. Having a side bar with the quest options woulda made that less chaotic than it is but it does certainly have a unique way of doing the quests. Overall though, the game has come a long way over the several years it has been in development. The team behind it is only three people, so it’s got quite a bit there for how small the dev team is. I found myself enjoying the game as an archer-spellslinging fool with a wolf companion, so it was fun seeing bandit NPCs run from my wolf. If you like sandboxy games that don’t give too much direction but just drop you into the world, you might wanna check this one out. It has a lot of fun stuff to it once you catch on to how things function, and all the skills are bought with coin so they’re all pretty easy to get. Once you have them, they level up through using them. I’d say the game is good, but definitely needs some more time in development to be taken too serious.